Here is an odd-shaped tower that was photographed on 2012/09/02. 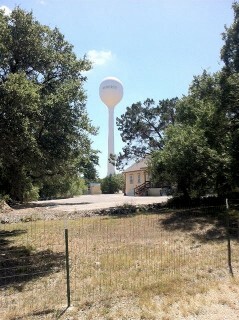 It is in the central Texas Hill Country on Ranch to Market Road 12 between Dripping Springs and Wimberley. The water tower has the name of its residential subdivision “Woodcreek”. The water tower is a very unique and odd shape. This site has often discussed the difference between water spheres and water spheroids, but this one is a completely odd-duckling. It’s a composite shape of two differing parts. Its top is taller than it is wide. It is not a sphere or spheroid, rather is appears to be a sphere with a cylindrical mid section. In other words, take a sphere, bisect it horizontally, and add a cylinder in the middle. It’s a beaut. Go see it near Wimberley, Texas. More views and geographic location is available from Google Maps. This entry was posted on Tuesday, September 4th, 2012 at 6:43 pm	and is filed under Competitors, Experiences, Photos. You can follow any responses to this entry through the RSS 2.0 feed. Both comments and pings are currently closed.